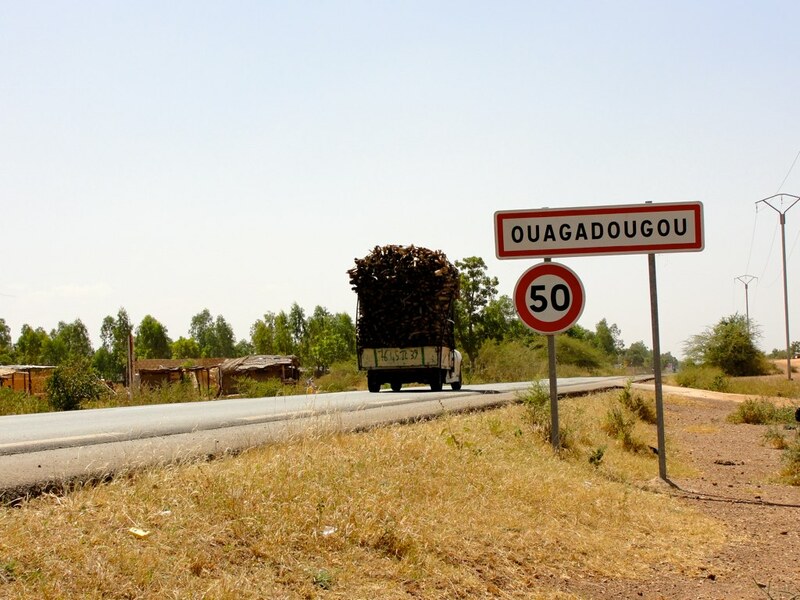 A sign indicating the Ouagadougou city limits. A country known for its tolerance, cultural richness, and diverse populations is increasingly becoming a target of terrorist attacks. Burkina Faso, a small, landlocked country sharing its borders with six neighboring West African countries, has recently come to international attention after facing numerous security threats. The 2016 Ouagadougou Attack left 28 dead and 56 injured. Terrorists stormed Splendid Hotel and Cappuccino café located in the heart of the capital city, Ouagadougou, shooting civilians and barricading themselves from local authorities for 15 hours. In a similar attack the following year, 26 people were killed by terrorist forces, Al Qaeda and the Islamic Mahgreb (AQIM), who stormed a local restaurant and fended off Burkinabè authorities for seven hours before being killed themselves. Following these and a series of an estimated 20 attacks between 2015 and 2016, Burkinabè officials have bolstered military presence and anti-terrorist initiatives to respond to the rapid growth in terrorist activity. Since 2016, terrorist attacks have not only continued but ratcheted up. As the West African cinema capital geared up for its famed Fespaco Festival in March 2017, two police checkpoints at the northern Burkina Faso–Mali border were attacked, killing three people. In the same month, two civilians were taken hostage and a school was set on fire. The following year, another Al-Qaeda affiliated force, the Group to Support Muslims and Islam (JNIM), focused their attention away from terrorizing quotidian targets with small-scale weaponry to utilizing sophisticated rocket launchers to strike the army headquarters and French embassy in downtown Ouagadougou, causing extensive damage and injuring and killing civilians. The attack may have targeted the G5 Sahel anti-terrorism talks in which West African nations and French forces collaborating to quell extremist violence with joint military troops were meeting. Burkina Faso shares its borders with several West African countries. Some suspect that the rise in terrorist violence targeting both civilians and government officials is occurring due to the recent elections in which president Campaoré stepped down and president Kaboré took office. One source claims that there have been over 80 terrorist attacks throughout Burkina Faso since 2015, particularly in the north along the border with Mali. Another estimates some 200 militant attacks bludgeoning the country since 2016, killing an estimated 263 people. For over a decade, Compaoré’s regime “cut deals with armed groups, allegedly providing them with logistical support in exchange for their neutrality,” successfully maintaining peace. As of December 31, 2018, president Kaboré declared a state of emergency after JNIM forces ambushed and killed 10 gendarmes who were investigating an attack on a school in a northern province along the Mali border. Some potent terrorist threats in Burkina Faso include JNIM, AQIM, and Ansarul Islam, which is led by Burkina Faso native Malam Ibrahim Dicko. While few of the major terror attacks have been claimed by these groups, the vast majority of the attacks remain unclaimed, leaving families, communities, and government forces unaware of where to pin the blame. In 2015, after three decades of authoritarian rule, Burkina Faso’s President Campaoré was ousted from power and forced to flee to Côte d’Ivoire. While president, Campaoré maintained stability within a region facing growing extremist activity by welcoming notorious rebel leaders like one of Liberia’s previous presidents and warlord guilty of war crimes, Charles Taylor, not to mention a slew of others from Angola, Chad, the Central African Republic, Mali, and Burundi. Campaoré maintained power from 1987 through 2015, thus making his reign one of the longest in Burkina Faso history—a country historically known for its high frequency of coup attempts. His plan to alter the constitution to increase term limits combined with disapproval of an elite security force, the Presidential Security Regiment or RSP, triggered massive street protests that ultimately threw him out of power. Quickly, his ally and the chief of the RSP, Diendéré (who has since denied responsibility and blamed the transitional prime minister, Yacouba Isaac Zida for leading the coup), “took advantage of the weak interim government led by Michel Kafando to dissolve the transitional government” and staged a coup. However, swift and critical international censure combined with negotiations ended the coup and re-instated the interim government until elections placed current president Kaboré in power. An election poster in Ouagadougou. Researchers argue that Campaoré’s complicated web of relations to the who’s who in West African and Sahel rebel and Islamist movements was a “deal with the devil”. Whether tacit or explicit, agreements between Campaoré’s party and jihadists facilitated a two-sided relationship. The Burkinabé government had negotiating power to promote its interests in the region, such as releasing hostages, and secured for jihadists a safe-haven and a state-level ally to provide them refuge and support. The disbanding of the RSP by the interim government also left a vacuum in private security the president had used for decades to carry out operations and cut deals with extremist groups. Following an uptick in extremist violence beginning in 2016, the Burkinabé military cracked down, particularly in the north and in the capital, against militants and suspected extremists. In the process, Human Rights Watch (HRW) documented human rights abuses committed by government forces such as arbitrary arrests, executions, mistreatment, and beatings. Furthermore, the vast majority of cases documented by HRW found that the majority of victims at the hands of both militant Islamists and government forces alike were ethnic Peuhls, raising a concern of targeted ethnic violence. Civilians, particularly those in the north, expressed fear of violence from both extremist groups and government forces, arguably reducing the incentive to cooperate with counter-terrorism initiatives. As a whole, Burkina Faso—a small, under-reported country—is facing an increasing security crisis. Nascent democratic governance, disbanding of highly trained private security forces, and rising evidence of ethnic violence from both government and terrorist forces threaten the country’s capacity to contain terrorism seeping in through its northern borders.